We are now able to hire a spit roast machine to customers purchasing hogs, lamb, goat or beef from us. 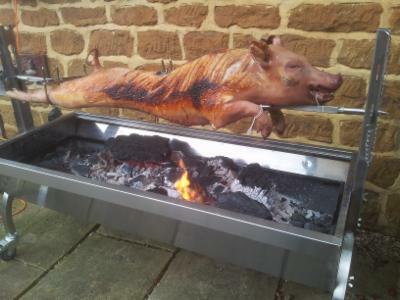 Having many years experience of spit roasting we know all about the problems we commonly encounter and overcome as professional caterers, and so we set about finding an easy to use well designed machine which was simple to use for the diy hog roast hirer. We were delighted when we found this stainless steel machine with electric spit that provides authentic roasting of a beast over a bed of wood or charcoal. For the authentic hog roast experience nothing beats watching a hog slowly turn over hot coals, self basting, the occasional drop of fat sizzling on the coals whilst enjoying a cold one (well it would be rude not to). Seeing the crackling slowly turn that perfect colour as it turns crispy. When the hog is ready (this one here was ready in just 3 hours) take it off the heat, let it relax, before peeling off the crackling and carving up the pork. You're then ready to serve - either in a fresh bread roll with sage & onion stuffing and apple sauce or on a plate with sides. Our spit roast machine will cook over charcoal or wood and if you fancy having a go yourself for a special occasion or simply a family get together we can put together a hire package just for you. We have a step by step guide to take you through the process and the spit is electric simplifying things. We also have BBQ grills available for use with the machine to make good use of the hot charcoal cooking sausages, burgers, kebabs, chicken and fish for a wider variety of food and to feed additional people. Or if you're feeling lazy let us do it all for you - cook, carve and serve. Just let us know what we can do to make things perfect for you. *** This machine has a replacement value of <£500. You are responsible for the machine whilst it is in your care. Any damage caused through either abuse or neglect will be charged to the hirer and may exceed the deposit up to a maximum of £500. If any difference is not remitted promptly additional costs and interest may be incurred. If you do not wish to clean the machine you are welcome to return it dirty and we will clean the machine for a charge not exceeding £50. Typically we will charge £5 for coal/ash disposal, £5 for carcass disposal and £15 for a basic clean. This charge will increase up to a maximum of £40 if the machine is particularly dirty/abused. Any missing parts/damage will be repaired/replaced at cost plus an admin charge, not to exceed the replacement cost of the machine. When hiring this machine we will provide you with our spit roasting guide. It is very important that you adhere to this especially regarding balancing the hog. The spit motor is rated to turn a 40kg balanced load. Exceeding this limit and especially asking the motor to turn an unbalanced load will cause permanent damage to the motor affecting your ability to roast your hog and forfeiting part or all of your deposit. A larger motor for balanced loads up to 80kg is available. The beauty of this machine is that with 6 wingnuts the legs are removed and it will fit across the back seat of most vehicles, or in the boot with the seats folded forward. This allows you to collect the machine and hog from us 24/7 by appointment. Of course we are happy to deliver the machine to you and can quote for this. You can then either return the machine yourself or via courier (we've found Parcel Force to be quite effective - if using a courier ask us in advance for a box for the machine), or we can collect the machine. Please note, the delivery and collection charge may vary. If we are asked to collect a machine post hire we will deduct this charge from your deposit.